Over 500 years since Vasco Nunez de Balboa "discovered" the Pacific Ocean (never mind that the Chinese, Japanese, and Pacific Islanders already lived along or within it), modern explorers have found yet another previously unknown ocean--on Saturn's moon Enceladus. The discovery was made by NASA's Cassini spacecraft over the course of 19 flybys of Enceladus. And while Cassini is not equipped with instrumentation designed to look within an object and see what's there, NASA was able to take advantage of Cassini's communications gear to infer the ocean's presence. Is Cassini a high-tech divining rod? The concept is straightforward, even if it may seem like using a divining rod to find water. As the Cassini spacecraft flew by Enceladus, beaming a radio communications signal back at Earth as it went, its trajectory was altered slightly by gravitational "bumps," or "potholes," in its path. The "potholes" are variations in the strength of Enceladus' gravity caused by differences in mass density on and under its surface. Cruising through areas of weaker and stronger gravity as it passed over regions of lesser and greater density, Cassini's flight path dithered up and down like an airplane flying through pockets of air turbulence. Thus, a map of structures on and below Enceladus' surface was made, and after multiple flybys a picture developed, inferring the existence of a regional ocean of liquid water up to six miles deep and located 19 to 25 miles beneath the moon's icy crust. 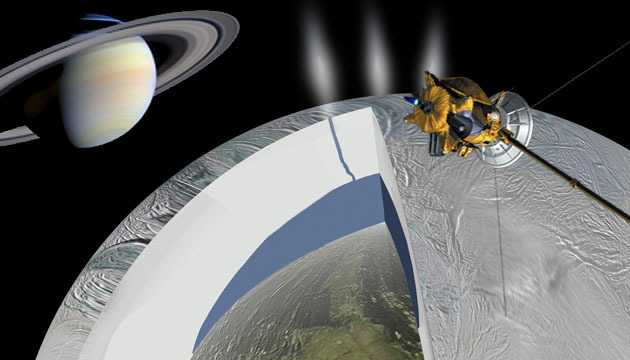 We've known of the presence of subsurface liquid water in Enceladus for ten years, since Cassini first captured images and measured the composition of plumes of water spewing from long crevasses in its surface. A system of tidally heated geyser chambers was speculated to explain the plumes—and the idea still holds water even with the detection of the deep ocean below, which may or may not be connected directly with the plume eruptions. In any case this further indication of copious amounts of water in this tiny moon puts it on a favored list of places in our solar system that may harbor life-friendly environments. In fact, Enceladus' ocean is the third "exo-ocean" we may have discovered in our solar system. We've long suspected the presence of a deep global ocean beneath the icy crust of Jupiter's moon Europa, based on patterns of surface fracturing imaged by the Galileo spacecraft. Saturn's large moon Titan is also suspected to possess a deep liquid water ocean far below its frigid surface. Gravity is an amazing tool, and this isn't the first time it's been used to divine the presence of unseen things. Even here at home sensitive measurements of Earth's gravity across different geographic regions have been used to infer the existence of subterranean structures like petroleum reservoirs. The Hubble Space Telescope has captured images of very distance galaxies and quasars through the "gravitational lens" effect, in which a mediating massive object (like another galaxy or cluster of galaxies) between us and the distant object bends and focuses its light like a big lens—sometimes even creating double images of the same distant object. Gravitational lensing has also been used to detect much smaller objects much closer to home by measuring the gravitational bending of a star's light by another object. In this case the object acting as the gravitational lens, which could be another star or a planet, is not merely the tool but the object of scientific interest. By measuring the effect of the intermediate object's gravity on the more distant star's light we can learn something about the nature of its mass. Recently this gravitational "microlensing" technique revealed the possible detection of an "exomoon:" a moon in orbit around an extrasolar planet. The brightening of the distant star by the microlensing effect revealed the presence of two objects, one with about 2000 times the mass of the other. This could mean a star with a planet, or a planet with a moon—though we can't be sure which. And there is no hope of a repeat observation to verify these particular objects' existence: their passage between us and the distant star was a one-time event. But the observation is encouraging to scientists looking for other exomoons. It's been said that all of the easy astronomy has been done—the kind you can do with a conventional telescope. To coax out the far more subtle mysteries in nature scientists are having to resort to some highly unorthodox tricks, like finding hidden oceans with big radar guns and spotting serendipitous alignments between distant stars, exoplanets, and exomoons.